Two years since it was first announced and over 500,000 reservations later, the Tesla Model 3 is finally here. It is the fourth, and arguably the most important model from Tesla. It is supposed to be the car that take Tesla to profitability. Most importantly, at $35,000 before tax incentives, it is supposed to be the electric car for the mass market. I rented the Model 3 for one day and here is my experience. "Why do electric car have to look so ugly!" is the comment that I most often hear. I have to agree that this is true for most electric cars, but not Teslas, and definitely not the Model 3. I actually think that the Model 3 is one of the best looking rear-wheel drive compact sport sedans on the market right now. The car is well-proportioned with a slight forward lean. It has a fastback profile like many new cars these day. The front-end is very unique with no grill (electric car doesn't need one since it doesn't have a radiator) with the Tesla badge on the hood which is, dare I say, Porsche-isque. The rear-end is also very clean with a single Tesla logo at the center and no other badges (not even the Model 3 designator). There are also no chrome bar running across the back like in the Model S. Also like the Model S, the tail lights look like those from the previous generation Jaguar XF, which is quite good looking. The 19" sport wheels is handsome and a must get for $1,500. The personally like the Midnight Gray and Red Multi-Coat colors (both $1,000 option) on the Model 3 but the car I am driving today is Black, which is a free option. One of the thing that I wish the Model 3 has is a better signature headlight. While you can distinguish the different Audis "eyeliners" and the BMWs "angel eyes", the Model 3 headlights look rather old school. 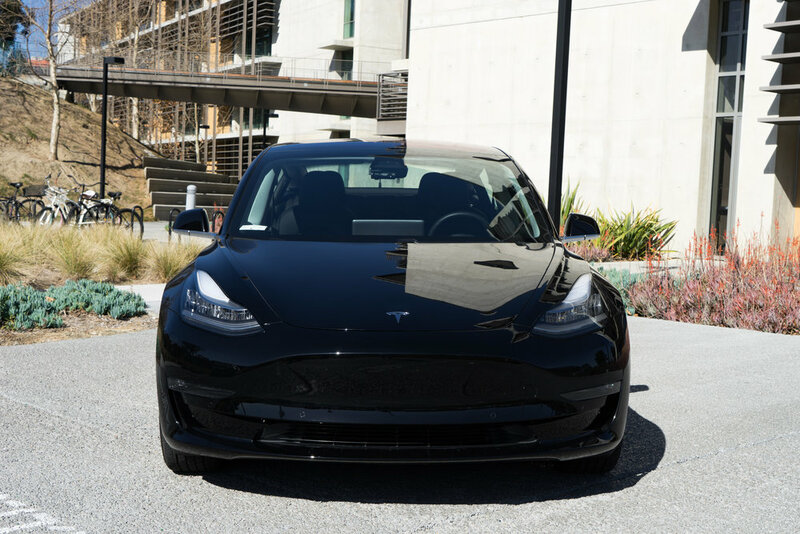 I also prefer cars with an upward angle on the side mirror stems rather than parallel to the ground like the ones in the Model 3. But honestly, these are very minor complains. The single 15" high-resolution, horizontally mounted multi-touch display is the center-piece of the interior and is the control center for almost every function of the car. Due to the lack of the driver's dashboard, important information for the driver such as speed, turn signals, charge level and wiper speed adjustment are displayed on the left third of the center screen. The rest of the screen is covered by a high resolution map powered by Google. Buttons for different functions such as music and smartphone controls are located in the bottom of the screen which when pressed will bring up a card overlaying the map screen like in the old Palm Pre smartphone. The high resolution 15" touch display is very responsive with modern interface. Every latches and lifts are electronically controlled, this include the opening of the hood, trunk, doors, charging port, and even the glovebox (yes, an electronically controlled glove box!). The only mechanical override that you have is the interior emergency latch for the doors. Despite being the cheapest car in the line-up, the Model 3 computer and interface is much more refined than the one in the Model S that I drove last year. The map loads quickly and there are no questionable graphics and fonts used in the interface. I'd imagine that this new design will find its way over to the Model S and X in the future with software update. One major bummer for me is that the main display does not display Thai fonts which is such an early 2000s MP3 player problem to have in such a high-tech car. Japanese, Korean, and Chinese works fine, though. No Thai font display! Granted, most other German luxury cars cannot display Thai either. Honda Civic could though! Ahhh....the key. You might wonder why a separate section is warranted for the car key. Actually, the word "key" isn't really accurate, since the Model 3 can be driven off when it detects the owner's smartphone in the car! Because this is a rental (and the owner obviously cannot give his phone to me), I was given a backup "key" which is this credit-card sized RFIC card. To unlock the car, you simply place the card on the B-Pillar and press on the door handle. The car will then automatically turned on as it detects you in the driver's seat. To drive, you would then placed the key near the cup holders, pressed the break, shift it in gear and away you go. Push button start is so....2010. This is the Model 3 car "key"
This is how you start the car. This step can even be skipped if you have your phone programmed as a key. Tesla interior designers has definitely take simplicity to the extreme with this car. As mentioned, the 15" display is the main, and only, focal point of the interior. The visibility out the front is excellent without gauges cluttering the front of the driver. With the $5,000 Premium Upgrade, this car comes with a modern light-colored wood-trimmed dash. Air vents are integrated throughout the dash with locations of airflow electronically controlled through the main screen. The headliner is a nice light grey woven material (not Alcantara). The glass roof, while not retractable, spans the whole length of the car. Overall, I really dig how simple and airy the cabin feel. Minimalists will be pleased with the Model 3 simple and airy interior. The 15" screen is the center piece of the car. I'd prefer sliding plastic cover for the vanity mirror. All the niceness aside, there are some questionable materials used in the interior. For example, the vanity mirror cover under the sun visor looks like a knock-off Smart Cover for the iPad that you can get for $10 from Amazon. The glossy plastic covers for the center console cup-holders and phone charger look and feel like plastic casing of a Western Digital external hard drive. These are things that you would not expect to see in a car that is priced and aimed to compete with luxury German sport sedans where there are high-quality plastic and leather everywhere you touch. Another thing that came as a surprise to me as I drove the Model 3 at high speed on the freeway is the cabin noise. The wind sound is almost as loud as in the Mazda 3 and is significantly louder than the 2018 Audi A4 that I have recently driven. Most of the sound seems to be coming from the top side of the car where the windshield joins with the glass roof. I am not sure if this is the issue of insulation or the design of the car. There are also some road noise, but that is expected from the larger 19" wheels. The panoramic glass roof alone is probably worth getting the Premium Upgrade for. It makes the car feel very roomy and also increases the headroom of the rear seat passengers. Luckily, as part of the Premium Upgrade is a "premium audio system with more power, tweeters, surround speakers and subwoofer" that you can use to drowned out road and wind noises. Tesla did not specified how many speakers are in the cabin (I counted 10). It is an overall good sounding system with clear high and warm base. There are a lot of storage spaces throughout the car. In addition to standard cubby in the center console and the electronically-latched glovebox, there are spots underneath the touchscreen with ports to dock your iPhone and a USB-C device. There is also storage space under the hood (aka the "frunk") that fits a small backpack and groceries bags like in rear and mid-engine Porsches. The trunk is also surprisingly large with a very wide opening. There is even a false bottom in the trunk that allow you to fit even more stuff (or even a 6th person!). Rear seat folded down in a 60/40 configuration to accommodate longer luggages. The trunk is pretty roomy. I can even fit sitting upright! Driving an electric car of any kind is an experience in itself. The first difference from your regular gasoline car is the fact that you have instant torque at any speed from the electric motor. Also, there is no engine sound except a faint electric motor whine as you accelerate which makes it feel like you are driving a spaceship! All electric and hybrid cars also have a regenerative breaking feature where the rolling energy of the car gets converted back to charge the battery when you lift your foot off the pedal. This has additional benefit of not wearing out your break pads quickly. You can set how much regenerative breaking the car does through the option on the main screen. Like I have described in my Model S experience, I don't think that the 0-60 time is the most important spec of the car, but rather how the car accelerates at cruising speed. I feel confident every time I need to overtake someone on the freeway as the car would go as soon as I put my foot down. This instant torque makes the car really fun to drive. And although it is suppose to be slower on the spec sheet compared to the Model S, I definitely did not feel it. There is no instant where I think "man, I wish this car has more power". Steering feels quite responsive. Like its bigger brother, the weight of the battery pack in the bottom of the car helps make the car feel more planted. I also feel that the Model 3 size is much more manageable than the Model S. I do not feel the car "helf" like when I was driving the Model S on the freeway. 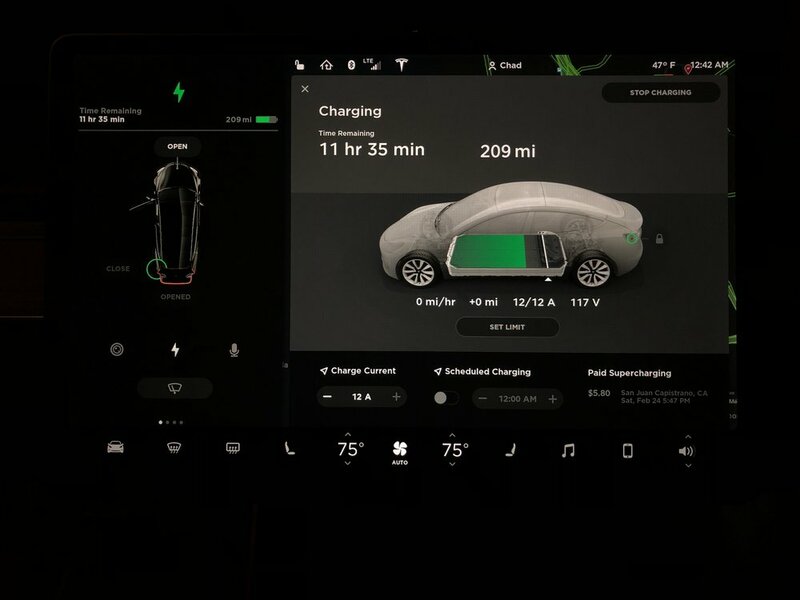 It is also much easier to park the Model 3 and the Model S. You can also control the steering respond (Comfort, Normal, and Sport) through the main screen. However, the only difference that I feel is that the steering just becomes more sensitive but not really lighter as you go from Sport to Comfort. I prefer a steering system that lighten the steering at low speed like the one in the Audi A4. Autopilot is probably the most high-tech feature of this car. With the Enhanced Autopilot (a $5,000 software-enabled feature), the car will speed up/slow down by itself based on its distance from the car in front as well as keeping itself in lane on the freeway. 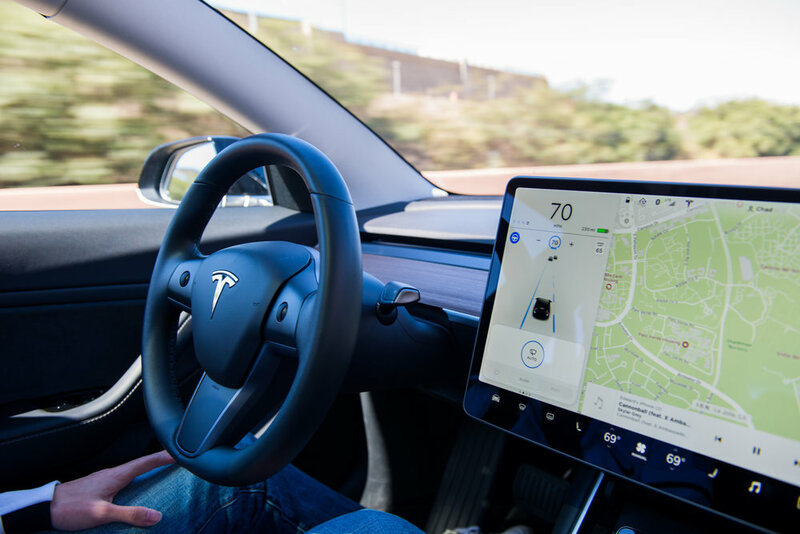 While the feature might feel like a showpiece for anyone who has never been in a Tesla before, it is also quite useful in a stop and go freeway traffic like the one up I-5N. I feel like the car accelerates and breaks smoother than if I were to manually drive in the traffic myself. The system feels like a major improvement from the last time I tried on the Model S, due to the constant software updates that Tesla sends out to its entire fleet. The small blue steering wheel symbol underneath the speedometer indicates that Auto Steering is engaged. The Enhanced Autopilot option also comes with self-parking where the screen where the car will prompt you to allow it to park itself when it detects a parking spot. While this option is already available in quite a few of modern cars, It is still very impressive to see it happening live. I tried the feature with a rather large parallel parking spot as seen in the video. Now, if you are always paranoid about constantly being watched by the "big brother", you might not like this car. Not only that there is a small camera right above the rear view mirror looking into the cockpit ( it is not active, according to the owner), the car also senses whether your hand is on the steering wheel. This is to prevent driver from doing other things in the car while Autopilot is engaged. If the warning is ignored one too many times, the car will not allow you to use the Autopilot feature for the rest of your trip. Or really, the electricity. This particular Model 3 comes with a $9,000 Long Range Battery "option" (more like a required option for these First Production cars) which is good for an EPA-rated 310 miles. This range is perfect for a trip from San Diego up to Orange County. Unlike when I was driving the Model S60 (with rated 215 miles range) where I always was worrying whether I would have enough charge to go places, I did not really have "range anxiety" with this car at all. Supercharger will charge the car up very quickly. However, it is not free for Model 3 owners. That said, to be able to take the car on a trip like this you will need to have options to quickly charge the car up. Luckily, I live in Southern California where there are ample availability of the Tesla Superchargers. It should be mentioned though that unlike Model S or X owners who get access to the Supercharger for free, Model 3 owners will have to pay around $0.20/kWh of energy (in SoCal) at the Supercharger. Still, my ~200 miles drive costs around $14 which is half of the $28 (8 gallons at $3.50/gallon in CA) that I'd have to pay if I was to use my Mazda 3 for the same drive. And that's comparing to the Mazda 3 which has a pretty decent gas mileage (27 mpg combined) and uses regular gasoline. Fueling up luxury sport sedan like the BMW 3 series, Audi A4s, or Mercedes Benz C-Classes would obviously cost a bit more. You will definitely need a 240V outlet to be able to charge at a meaningful rate at home. I tried charging on a standard 110V outlet at 12A at home and can only get ~15 miles after almost 8 hours of charging. You might ask, can't we just always use the Supercharger? I suppose you could, but Tesla has said that this is not recommended as the Supercharger pushes very high current into your battery (up to 48A) and doing so regularly could degrade your battery capacity quickly. Charging with the 110V outlet for 8 hours over night gave me only 16 miles. A 240V outlet is definitely needed. Update 11/15/2018: Since I wrote the review, Tesla has made a lot of adjustments with the different configurations of the Model 3 (and will continue to do so in the future). Elon Musk has tweeted that there is no such thing as a "model year” for Tesla since the car will continue to get updates as soon as they are ready. 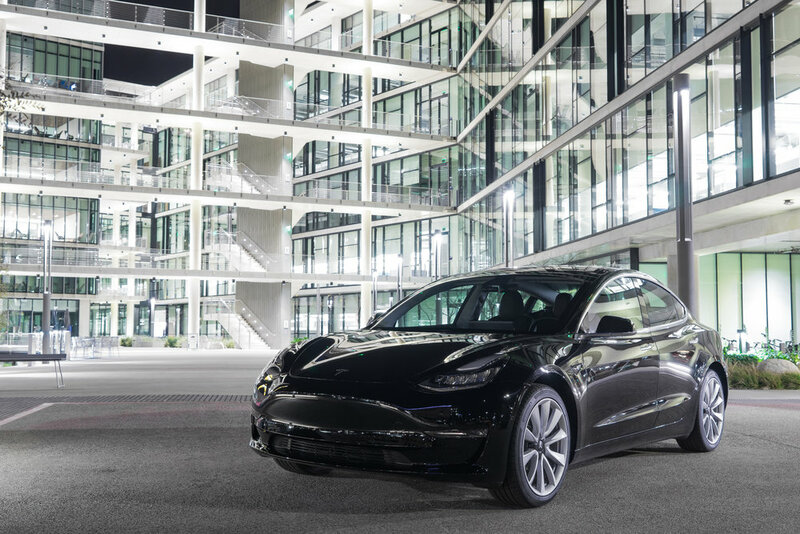 Currently, the Model 3 is starting at $46,000 before taxes and fees and any incentives for the rear wheel drive, a medium range 260 miles battery pack version. This is still not the $35,000 car that Tesla promises two years ago but is $3,000 more affordable that the original configuration available a few months ago. 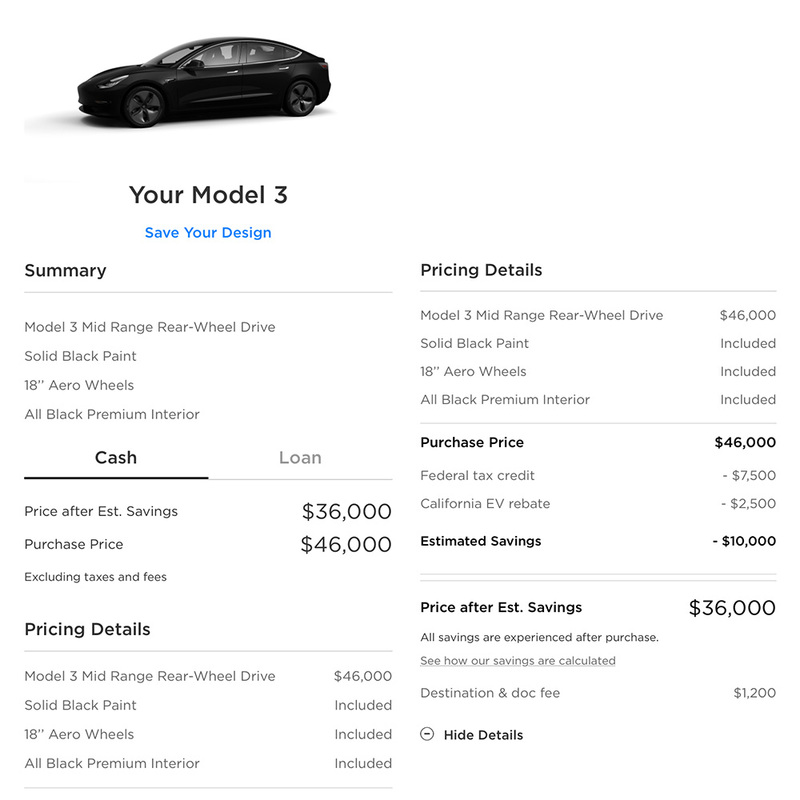 The Model 3 is now starting at $46,000 before taxes, fees, and incentives. The price after saving shown includes $7,500 Federal Tax Credit and $2,500 California Cash Rebate. However, you must take delivery of the car by the end of the 2018 to be eligible for full the $7,500 rebate. Now, as Tesla has reached the 200,000 car delivered target in the United States in Q3 of this year, the Federal Tax Credit for Tesla is now start to get rolled back. As a result, you must take delivery of the car by the end of the year in order to qualify for the full $7,500 Federal Tax Credit. The above configuration is shown lead time of 6-10 weeks, which might mean that the tax credit could be cut in half to $3,750 by the time you take delivery of the car. As for me, I finally bit the bullet and got my Model 3 since June! If you are thinking of placing the order then please use my referral link to receive 6 months free supercharger. I'd like to thank Chad Hurin of Frunkyea Tesla Rental for renting me his Model 3 for a day. In addition to the Model 3, Chad also has a Tesla Model S and X for rent on his Turo account. Don't forget to use my referral code to get $25 off your first rental. Also, thanks to my roommate Pop for some of the beautiful photos featured in this post. You can follow him on Instagram @p.uncertainty.